For the true music lover, there is nothing quite like a great festival. What could be better than taking a few days off from your life to hear your favorite artists with thousands of people just like you? The U.S hosts such a smorgasbord of festivals that no matter what your musical tastes there is sure to be an event for you. These are a few of America’s greatest music festivals. Ready to rock out? This hot 3-day music festival in the California desert should be a definite summer stop on all USA holidays. 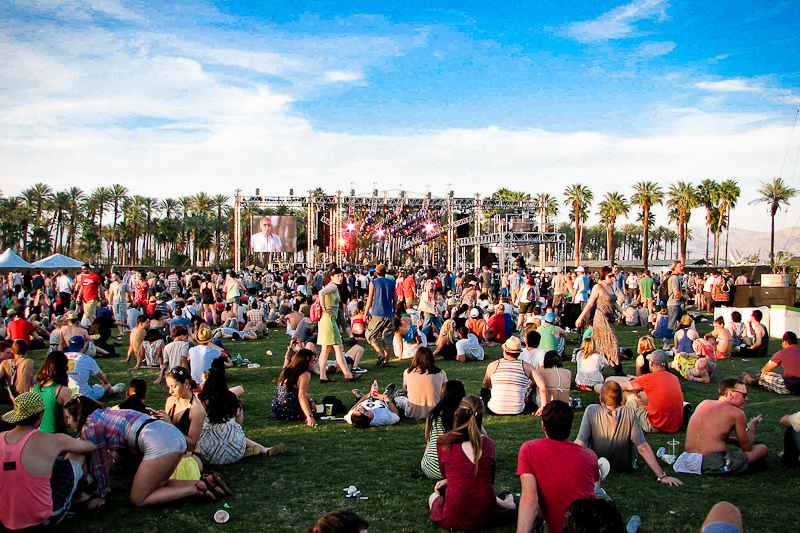 The largest attended festival in the U.S. Coachella showcases a variety of genres including pop, rock, hip-hop and dance music. The 2012 show sold out within three hours, with headliners including Snoop Dog, Radiohead, The Black Keys and many others. The festival is set up in Indio, California where the desert grounds are covered with stage tents, huge quirky sculptures and art installations. Founded in the 90s, Lollapalooza is the oldest and most celebrated alternative music event in the U.S. Though Lollapalooza began as a touring festival, the modern event takes place in Chicago over 3 days in August and includes a wider variety of music genres than its original incarnation. The 2012 lineup includes Black Sabbath, The Red Hot Chili Peppers and Florence and the Machine. A relatively new festival, the Austin City Limits Festival was started in 2002 and has risen quickly to the top. Named after the widely popular music television program, the festival follows in its footsteps by showcasing hundreds of popular rock, indie, country, folk and electronic bands. This year’s festival will take place over three days in October in Zilker park in Austin, Texas. Best American Music Festivals: Sasquatch! For a festival centered around eclectic music tastes, Sasquatch! has developed quite a following. The festival, which takes place in on a beautiful green in the middle of Washington State, was created to celebrate eclectic musical tastes. The festival in late May caters specifically to indie rock lovers although alternative and hip-hop bands have also held the stage. The community is eccentric and easy-going with the vast majority of people camping out all 3 days. Bonnaroo music festival takes place on a 700-acre farm in Manchester, Tennessee, 60 miles outside of Nashville. Featuring a wide array of popular music styles as well as comedy shows and art installations, Bonnaroo is set apart by its laid-back, hippie atmosphere. In fact, Bonnaroo is so original that its was named one of Rolling Stone’s “50 Moments That Changed Rock and Roll.” In addition to music and art, the festival also hosts unique activities such as The Silent Disco Tent and the giant slip’n’slide known as the Splash-a-Roo. The perfect mix of music and community is what defines a life-changing festival experience and you can be sure these five American festivals have both. The true festival aficionado can’t afford to miss any of them. Luckily, if you ever needed a reason to spend your summer traveling across the U.S., now you have five!